Camp Nonesuch has shared the shores of Nonesuch Pond for over 35 years. The camp has held the same guiding principals and philosophy since its founding in 1980. During its inaugural summer, Camp Nonesuch welcomed just a handful of children, but as word grew, more and more children have come to enjoy the sunny shores of Nonesuch Pond, the rustic feel of its wooded property, and the fun and creative activities the counseling staff has offered over the subsequent summers. 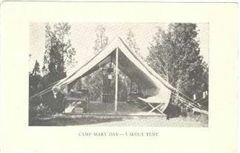 Formerly Camp Mary Day, the property was owned and operated by the Newton Girl Scout Council. All of the buildings on the camp grounds date back to the 1920s, 1930s and 1940s! As some of you know, each summer I ring in the camp season on the first day of camp and ring out the end of the season on the last day of camp with a bell that has become known affectionately as "The Nonesuch Bell." I'm not exactly sure how long the bell has been a part of the camp, but I do know it's starred in at least one Nonesuch Video and has become the central part of an important Camp Nonesuch tradition. When I became director many years ago, I found the bell hanging on the outside of the old office. It took a number of weeks for me to notice it as the brass was so tarnished it was well camouflaged against the brown cabin wall! One afternoon I took it down to examined it. Inscribed on the outside lip of the bell were the initials, "ARP" on one side, and "G & J 1939" on the other. Attempts at determining its origin and history were unsuccessful. I fashioned a handle out of a few wood spools and a wooden ball and placed it in on the mantle of the office fireplace, a place of prominence where it waited proudly to dispatch it's new duties! Recently I did a little more research and discovered that our little bell has quite a history. It turns out that the "ARP" stands for "Air Raid Precaution." 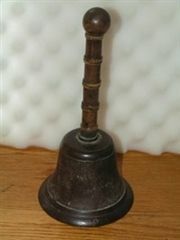 The bell was used in Great Britain during World War II by the Air Raid Precaution Wardens. The ARP bell's function was to declare an "all clear," letting residents know that it was safe to be outside again. "There were around 1.4 million Air Raid Precaution (ARP) Wardens in Britain during World War Two. Their duties included supervision of air-raid shelters, enforcement of the night-time 'black-out' and providing help following bomb damage, such as rescue or demolition. Items of equipment such as this hand-bell were essential to the speedy and efficient execution of their duties. "The ARP Warden Service came into being in 1937, followed in January 1938 by the ARP Act which compelled local authorities to create ARP schemes. Many of Britain's 1.4 million wardens were part-time volunteers. All were expected to have detailed knowledge of their local area. "The hand bell was intended to be rung to sound the 'All Clear' signal, this could cause confusion with the 'Raiders Passed' signal. The latter was sounded on the siren as a continuous steady note, and signified that enemy aircraft were not threatening that particular district. "The cancellation of the local gas warning will be by hand bells, rung through the streets of the [warden's] sector. Hand bells may also be used to repeat the Raiders Passed signal but only if gas is not about. Hand bells will in fact be an "All Clear" signal, which is different from the Raiders Passed signal, since the latter will be sounded on receipt of the message from the national centre, whether or not there is gas in the locality." So our little bell has come a long way, both geographically and functionally! Once signaling that all was safe during very difficult times, it now it rings us into each camp season heralding a safe place for children to explore and play!